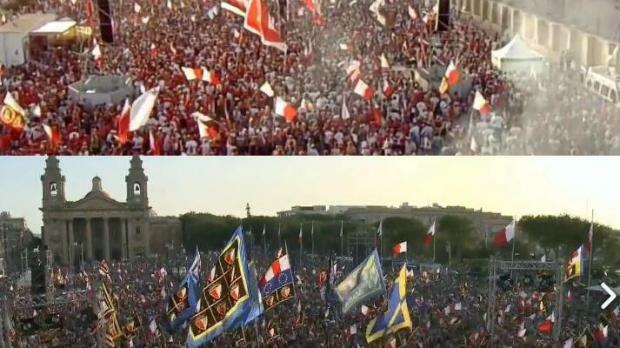 The election campaign closes tonight as the Labour and Nationalist parties gather their supporters for the final mass meetings at Ħal Far and the Granaries in Floriana respectively. Thousands of supporters have gathered at the two locations to hear their leaders pitch their message for the last time. Prime Minister Joseph Muscat is expected to dwell on his campaign message that Malta has never had it so good, asking voters to give him another mandate and ensure continuity. Opposition leader Simon Busuttil is expected to tell voters the country needs a clean sweep in the wake of corruption and only the Nationalist Party can ensure respect for the rule of law and good governance. The electoral campaigns officially close at midnight. Tomorrow Friday is known as the day of reflection when no political campaigning is allowed. The election will be held on Saturday.